The Elecom USB 2.0 Hub” U2H-I4S” provides a simple and reliable way to connect 4 USB devices to your PC.The USB hub has a top port for connecting easily USB port equipped portable players, USB flash memory, iPod shuffle etc.This is very convenient for mini music players etc which are used frequently for data, music transfer etc.The USB 2.0 hub comes with one USB-A to USB-B cable and 500ma AC adaptor. 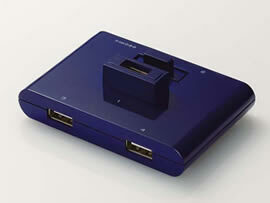 The USB HUB is available in 4 different colors- silver, black, blue and white. The unit measures 80×54×14mm (width × depth × height) and weighs approximately 50g. The Elecom U2H-I4S will be available from Mid February.